DMLS i.e. 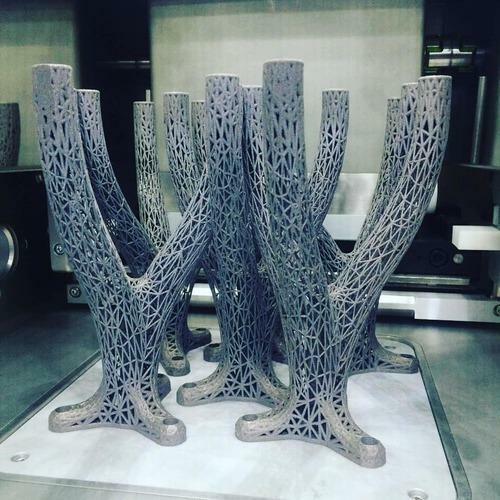 Direct Metal Laser sintering is a type of additive manufacturing that uses metal powder as raw material to produce metal products out of the machine. DMLS was developed by Elextrolux Rapid Development and the EOS firm of Munich, Germany. The DMLS machine uses a high-powered 200 watt Yb-fiber(Ytterbium) optic laser. Inside its build chamber area, there is a material dispensing platform and a build platform along with a re-coater blade used to move new powder over the build platform. The technology fuses metal powder into a solid part by melting it locally using the focused laser beam. This technology is used to manufacture direct parts for a variety of industries including aerospace, dental, medical and other industries that have small to medium size, highly complex parts and the tooling industry to make direct tooling inserts. The biggest pro to this tech is that complexity costs nothing. It requires the same level of expertise to print a block of metal as it would to print a perfect jaw bone replacement (provided you have the cad data). Currently available alloys used in the process include 17-4 and 15-5 stainless steel, maraging steel, cobalt chromium, inconel 625 and 718, aluminum AlSi10Mg, and titanium Ti6Al4V. The most commonly used raw material is Inconel. Inconel is a family of austenite nickel–chromium based super alloys. Inconel alloys are oxidation and corrosion resistant materials well suited for service in extreme environments subjected to pressure and heat. When heated, Inconel forms a thick, stable, passivating oxide layer protecting the surface from further attack. Inconel retains strength over a wide temperature range, attractive for high temperature applications where aluminium and steel would succumb to creep as a result of thermally induced crystal vacancies. Inconel’s high temperature strength is developed by solid solution strengthening or precipitation hardening, depending on the alloy. DMLS parts made from Inconel 718 have proven to have better mechanical properties than 718 castings. 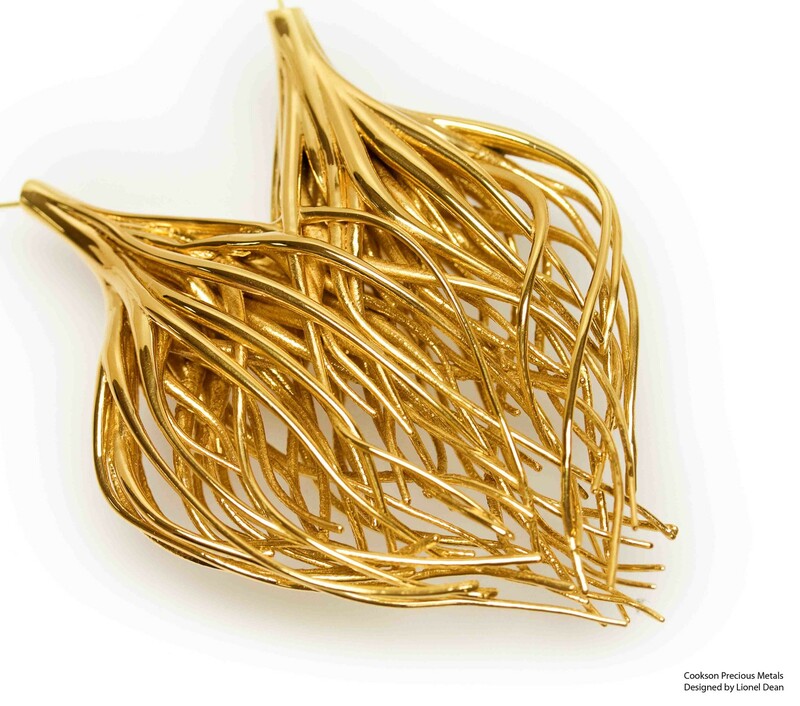 Laser sintering of Gold is a jewellery manufacturing technique first developed by Towe Norlén and Lena Thorsson is also very common in jewellery industry. Laser sintering of gold starts with gold powder, fine as flour. When the gold object is finished, it is gently brushed from the leftover gold flour, in much the same way as in an archaeological dig. The result is a gold object of virtually any shape, and with higher quality (greater surface density) gold, than that possible to achieve with casting. Moreover, laser sintering circumvents the weakening and surface-deforming mounting process, because the item of jewellery is manufactured in a single piece. Also, jewellery design may be expanded and individualised, as in principle any shape is possible, which facilitates uniqueness and personalised design. Just like other typical 3D printing technique, metal printed parts have rough surface finish and visible layers over the surface of the part. Thus, post processing and surface finishing is a must for functional parts. Typical surface finishing include, sanding, grinding, buffing, shot peen or glass beed of the parts. Also, Laser polishing by means of shallow surface melting of DMLS-produced parts is able to reduce surface roughness by use of a fast-moving laser beam providing “just enough heat energy to cause melting of the surface peaks. The molten mass then flows into the surface valleys by surface tension, gravity and laser pressure, thus diminishing the roughness.